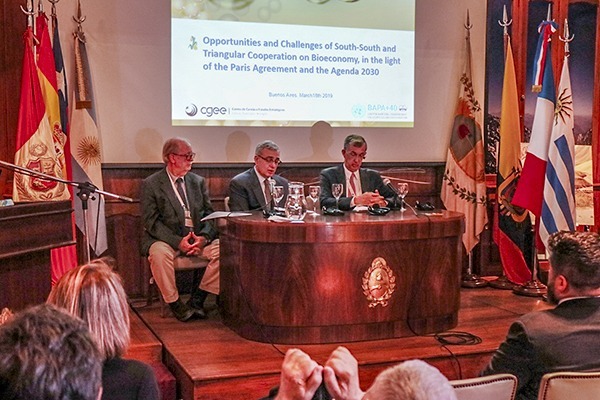 A dialogue on “Opportunities and Challenges of South-South Cooperation on Bioeconomy, in the light of the Paris Agreement and the 2030 Agenda” was held Monday at the Instituto Nacional Sanmartiniano in Buenos Aires, Argentina. The event was co-hosted by the Center for Strategic Studies and Management – CGEE/Brazilian Ministry of Science, Technology, Innovations and Communications and the United Nations Office for South-South Cooperation (UNOSSC), on the sidelines of the Second High-level United Nations Conference on South-South Cooperation (BAPA+40). Acknowledging the support received from the Secretary of Agribusiness and the Ministry of Foreign Affairs and Worship of Argentina, Marcelo Poppe, Senior Advisor of the Center for Strategic Studies and Management (CGEE) Brazil, opened the meeting. He also introduced the work of CGEE in areas of surveys, future literacy, text mining, trend analysis, risk evaluation, data mining, technology readiness assessment, network and patent analysis among others. He explained how South-South cooperation on bioeconomy could benefit the 2030 Agenda for Sustainable Development, particularly SDG 1 (poverty eradication), SDG 2 (zero hunger), SDG 3 (good health and well-being), SDG 6 (clean water), SDG 7 (affordable and clean energy), SDG 12 (responsible consumption and production), SDG 13 (climate action), and SDG 15 (life on land). Mr. Poppe also emphasized how South-South cooperation on bioeconomy contributes to the cross cutting agendas of wealth and job creation and land use and management. He further provided an example of a biofuture platform— a country led initiative of low carbon fuels and biorefineries development as an alternative to fossil-based fuels, chemicals and materials. Mr. Jorge Chediek, Director of UNOSSC and Envoy of the Secretary-General on South-South Cooperation highlighted that the 2030 Agenda and the Paris Agreement are not only global in nature but are vital for the achievement of sustainable patterns of production and consumption at all levels. H.E. Ambassador Sérgio França Danese, Ambassador of Brazil in Argentina, agreed with prior speakers and stressed that “South-South cooperation is a supplement to North-South cooperation and contributes to setting up partnerships to achieve the SDGs.” He emphasized the vitality of regulatory policy structures and financing mechanisms in efforts to reducing carbon emissions. Mr. André Murchison, Secretary of Food and Bioeconomy of the Ministry of Agroindustry of Argentina, charted the economic routes to achieve the SDGs through advancing efforts in the bioeconomy sectors in Argentina. Similarly, Dr. Fábio Larotonda, National Director of Departament of Programmes on Scientific Development of the Ministry of Science, Technology, Innovations and Communications of Brazil, shared examples of South-South and triangular cooperation in the area of bioeconomy between and among the Latin American, Asian and African regions. Prof Suani Coelho, Coordinator of the Research Group on Bioenergy of the Institute of Energy and Environment of the University of São Paulo, Brazil, discussed issues of sustainability and development, including in the context of rural development and best usage of waste. Attendees included government, international and research institutions, including non-governmental organizations. The participants raised questions regarding the concept and differences between circular and bioeconomy, areas of development cooperation that have progressed over the past years, the role of intellectual property rights in the context of South-South cooperation when it comes to innovation, and the demand for technical cooperation. The speakers responded to audience’s queries by highlighting the importance of bioeconomy from the social, economic and environmental standpoint. The impact of innovation in the economic cycle was also briefly discussed. With regards to intellectual property rights, the speakers noted the vitality of win-win situations in any kind of South-South partnership. 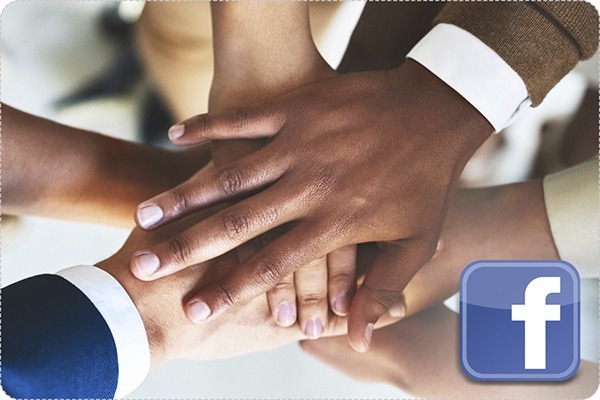 The organizers called for the participants at the event and their related networks to answer a survey on bioeconomy and South-South cooperation. These surveys will contribute to a publication to be launched at the twenty-fifth session of the Conference of the Parties (COP 25). Calling for South-South and triangular cooperation experiences, best practices and success stories on bioeconomy and climate change, Haroldo Machado-Filho, Senior Advisor of the United Nations Development Programme, Brazil, concluded the event.